For anyone that’s ever grown tomatoes, you’re probably familiar with the super disgusting, tomato loving hornworm! These rather big and green tomato worms can be a HUGE pest and will obliterate your delicious tomato plants in rapid fire! 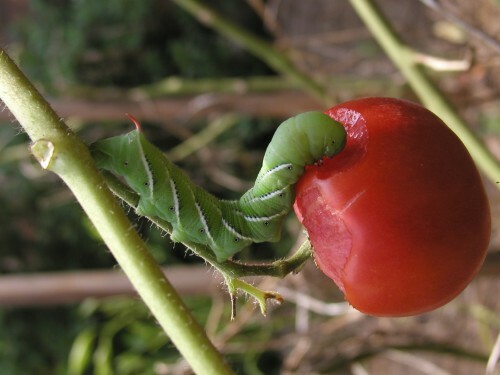 Thankfully, there IS hope: these 5 ways to get rid of tomato hornworms are easy to follow and will ensure that hornworms are no more and that they won’t return either! Hornworms are some of the biggest caterpillars you’ll probably see in your garden, and tomatoes isn’t ALL the eat. Tomato hornworms also love tobacco, potatoes, eggplants, some pepper plants, some night-shade family plants, and moonflowers. If you’re looking to kill tomato hornworms without harming other beneficial insects, go the organic way! Consider using Monterey BT spray, or BT which is short for Bacillus thuringiensis var. Kurstaki, which is a naturally occurring bacteria that will poison all manner of caterpillars, including tomato hornworm, cabbage worms, cabbage loopers, cutworms, and many other types of larvae. Another organic thing you can use is Garden Dust, which is a powdered form of the BT spray. Simply sprinkle the dust on the tomato plants, and it will work just as well as the spray! Another option would be to use pyrethrin sprays. There are many variations of these sprays on the market, such as PyGanic, which work very well. One of the best and most environmentally-friendly ways to get rid of tomato hornworms is to use the environment against them! These will usually be predatory wasps that will lay their eggs inside or on top of the hornworm, and once the larvae hatch, they will devour the hornworm. Lacewings and ladybugs are also helpful and killing off hornworms, because they will eat the eggs of the hornworms, although you’ll still have to pick off any grown hornworms. Companion planting is also a great way to ward off hornworms. Planting basil near your tomatoes will improve their flavor but also keep hornworms away. Planting marigolds will attract predatory wasps, which will then kill off the hornworms. One of the best ways to get rid of hornworms, is to prevent them from being there in the first place. To do that, use floating row covers over your plants. Tilling your garden at the end of the harvest season can also help reduce hornworm population. So now that you know how to get rid of tomato hornworms, it’s time to start planting tomatoes! 5 Ways to Get Rid of Tomato Hornworms was last modified: January 23rd, 2018 by Aniela M.
Did you know that “tomato hornworms” turn into beautiful and getting to be unusual Sphinx or Hawk moths? They are the size of hummingbirds and will sip from your flowers as night approaches, hovering and flying very much like hummingbirds also. Are you sure you can’t sacrifice just one tomato plant to them? Clip the branches they are on and secure them to the one tomato plant you choose. You can cover the plant with filmy plant cover or small opening netting to make sure you catch them transforming. This sounds like a wonderful idea and I plan to try it! Thank you!! You’re very welcome Juli! Please let us know how it works out for you! Find them, remove them, and stomp them works, too. I’ve found nearly 20 on one plant, a Datura, which is in the nightshade family. That makes nearly 20 moths that won’t be laying more eggs.